On March 23, 2018, MTI and NYK conducted a ship-to-shore connection test for the ship navigation support tool J-Marine NeCST,* and together with Japan Radio Co. Ltd. verified the effectiveness of the tool’s functions. For the test, a fire was presumed to have occurred on the cruise ship Asuka II, which is operated by NYK Cruises Co. Ltd. 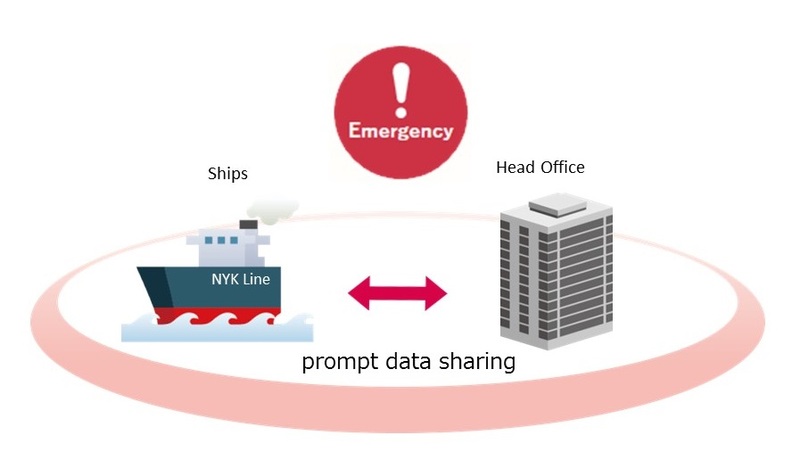 The two J-Marine NeCST tools — one aboard Asuka II and the other at NYK’s Crisis Management Center within the NYK head office in Tokyo — were then connected via the internet. The emergency [Fire] button on the onboard tool was activated, and an emergency checklist and fire control plan were immediately shared on synchronized screens. Prompt communication was then tested via the tool’s chat function. Each of the tool’s functions were confirmed to be effective. During an onboard emergency, particularly one involving fire, immediate and accurate communication between ship and shore is vital. Currently, onboard crews must report on the ship’s condition by phone, fax, email, or the like while engaging the fire, which should be the crew’s utmost priority. J-Marine NeCST allows us to bridge ship and shore and thus drastically reduce the burden placed on the crew. In addition, professional advice from land allows for an understanding of the real progress of the fire extinguishing work on board. The NYK Group will continue to combine on-site ideas with technology to create a safer work environment and address needed issues. A ship navigation support tool jointly developed by NYK, MTI, and Japan Radio Co. Ltd. The tool allows users to easily plan routes using the handwriting function of the electronic navigational chart, in addition to managing and sharing operational data using integrated information such as meteorological and hydrographical forecasts.